Back to art, for the last end of the world, I painted a new classical still life, realist still life of apples, three red apples. These are Jonathan apples on a piece of pink / red marble. I’ve chose to paint red apples because I have some issues painting reds. While many are complaining about painting green colors, I’m complaining of painting red colors. This is because red colors are mostly transparent colors and get dirty very easy. Any color looks ugly when get dirty and reds are no exception to. If you’re a realist painter, looking for a classical look of the painting, the Flemish painting technique is the best approach in painting red colors. So, you get start painting red elements either with a monochrome underpainting or an underpainting made of lighter shades of red. Over this under painting you come with several layers of red glazings. I’ve read in an old painting treaty that the best on painting red colors is by staring with an underpainting made of very light shades of red then glazing until you get the desired look. I followed this art tip and I certify it works very good. 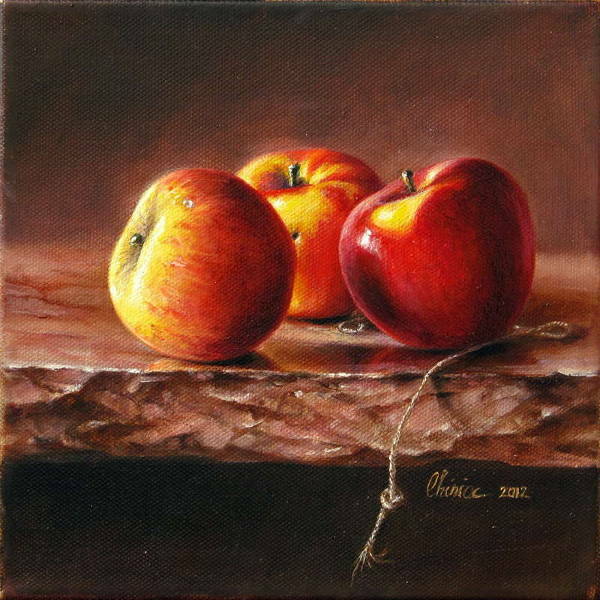 As about this still life art piece, it’s a small realist artwork of 8 x 8 inches, oil on canvas. Below is the breakthrough video of this little still life piece. Don’t forget to check if it’s still available for sale and that I gladly accept commissions for still life paintings, portraits, surrealist paintings, landscapes, originals or, if you love one of my sold paintings, a similar to that artwork, yet original.